A 90 year old male nursing home resident is brought to the ED for because of reduced level of consciousness. He has a background of significant dementia and type II DM. VBG showed moderate metabolic acidosis with lactate of 10. 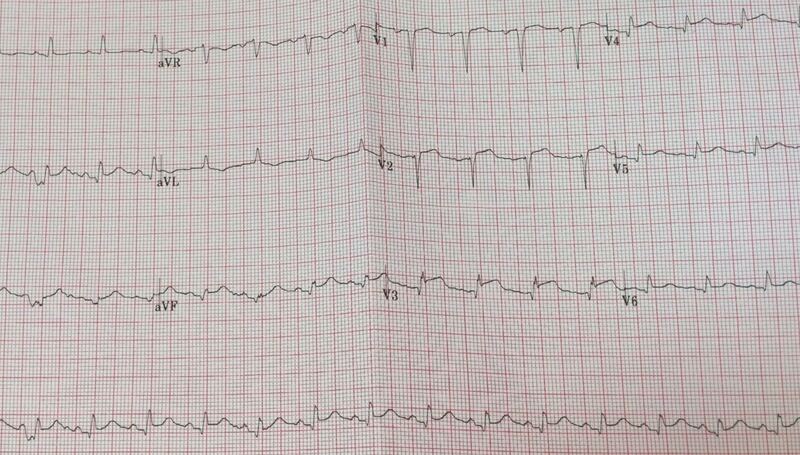 There is sinus rhythm with a slightly broad QRS and diffuse ST elevation in a somewhat atypical morphology for STEMI. There are anterior Q waves. The echo clips are of poor quality and off axis but are sufficient to show apical hypokinesis and ballooning consistent with a Takutsubo Cardiomyopathy. This is thought of as a stress cardiomyopathy associated with catecholamine release causing ischemia. There should be no coronary occlusion on cardiac cath. The patient was also suffering from HHS/HONK, had a new renal impairment and a severe pneumonia. He had previously discussed and documented a wish to not have aggressive intervention at the end of life and he was treated with comfort measures.